We are amongst the well-acknowledged Trader and EXporter of an attractively designed range of Designer Kids Casual Wear. Our designed range of Kids Casual Wears that are appreciated for optimum quality and colorful patterns. The offered range is neatly stitched by our experienced designers. We offer a wide variety of Kids Casual Wear that are designed from quality cloth material. 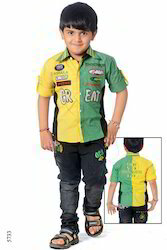 These Kids Casual Shirt have been made by us keeping the latest designs in mind. Our collection of Kids Casual Wear is authentic and very unique. The variety of styles and designs makes it a very versatile. Looking for Kids Casual Wear ?